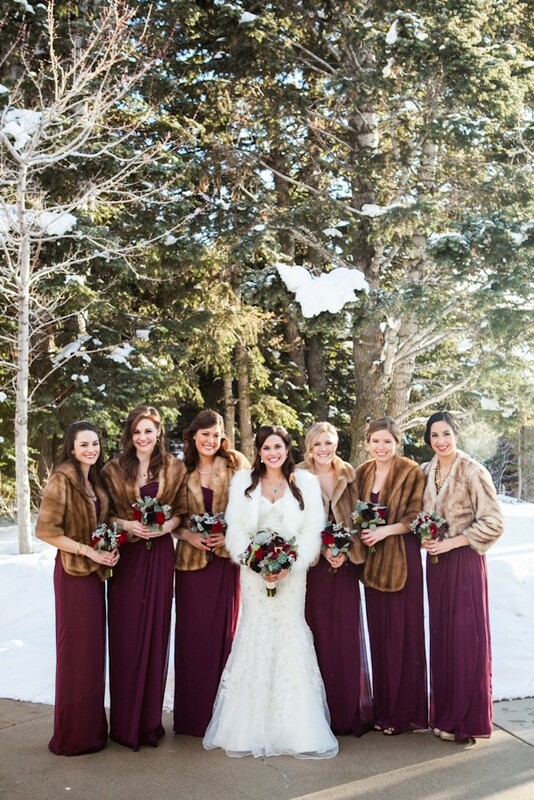 Bridesmaids in Fur Coats for Winter Weddings. Bridesmaids love accessories just as much as the bride. If your best girls need an additional option to keep warm for your winter wedding, a faux fur coat may be just the right addition for a fabulously gorgeous look. A group of bridesmaids can cover their shoulders in a fur coat that snaps in the front. The beautiful color of this coat pairs well with the soft blue color of these bridesmaids dresses. The bride stands out with a fur coat in a slightly different color. Bridesmaids look stunning in light brown fur stoles alongside a bride in white; the maid-of-honor wears an even lighter to coordinate with the group. For an outdoor picture session or even a snowy ceremony, these fur accessories will keep a group of bridesmaids cozy. While jackets aren't usually seen in weddings, these light brown and tan fur jackets are youthful and fun. The neutral gray bridesmaids dresses coordinate wonderfully with the jackets natural tones. Some brides opt to have black as their main wedding color. Bridesmaids can look elegant and flawless for an outside event in a long black dress with a beautiful short black fur coat. Bridesmaids can also accessorize in colors other than those that are natural. This group of lovely ladies wear navy blue fur boleros to match their long navy blue dresses. Bridesmaids can wear white, too. Dressed in blush, these bridesmaids accessorize with white faux fur wraps to get away with the color typically synonymous with just the bride. Winter weddings require cold weather accessories. Dressing your bridesmaids in faux fur coats is a lovely way to combine elegance and comfort without sacrificing style and finesse.